I have assumed that carbonated bottled drinks have the rugged base. But today I purchased a bottled drink in supermarket that doesn't have the rugged base, but it still was carbonated. So I can't discern carbonated drink from the base of the bottle. How can I discern it then? First, carbonated is the standard in Germany, and that's what most people expect, so it would be the default assumption for something you see in the shelves. Of course, it is written on the drink, but you need to be able to understand enough German to read it. 'Still' is the typical term used in German for non-carbonated water-realted; if you see that, it will be non-carbonated. 'Kohlensäure' means carbon dioxide, and if you see it, it is carbonated; typically in connection with the verb 'versetzt', which means that the carbon dioxide was injected in the water. There is no mechanical key or form factor that signifies it; many companies have carbonated and non-carbonated offers in the same bottles, with the same colors, with only different wording on the label. However, this is a method I learned as a kid and which I have rarely used since then. Probably all the limitations noted in the comments below are valid. There is absolutely no way that I know (native German) to tell without reading the label. Bottles, colors of caps or whatever, I have never noticed any pattern that discerns carbonated from not carbonated drinks. There is also "medium" used on mineral water to indicate that it is a little bit carbonated (i.e. less than normal mineral water). (1) where I come from (northern Germany), "Schorle" always means carbonated. As comments on other answers indicate, in other parts of Germany it might not always mean that. 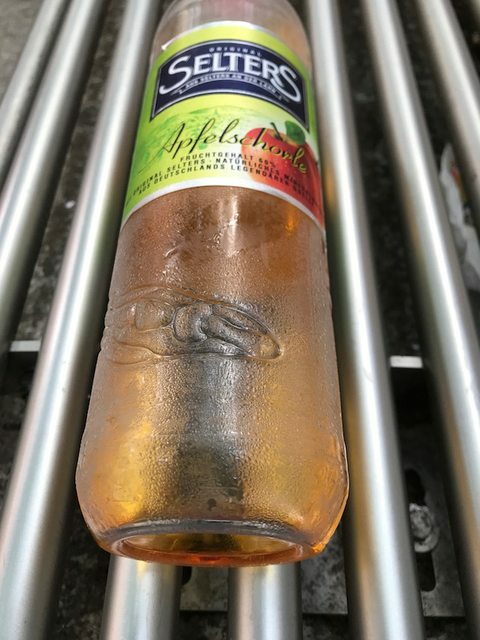 On bottles, however, I have not once anywhere in Germany bought something called "Apfelschorle" and found it to be not carbonated. (2) this is rarely written, mostly used when ordering in a restaurant, i.e. "Wasser mit Sprudel, bitte" - "carbonated water, please" - or you could be asked "mit oder ohne Sprudel?" - "with or without carbonation?" The name of the drink often shows if it is carbonated. The drink on the image is named "Apfelschorle". "Schorle" is carbonated juice. "Apfelsaft" on the other hand is natural apple juice (juice is "Saft" in German) without carbon dioxid. For water Aganju said the important thing: Normally bottled water is carbonated in Germany. If not it is usually labeled with "Still". If it is carbonated you often find terms like "Kohlensäure" or "Medium". Just a word of warning: if you really cannot abide carbon dioxide, "Still" is not even a guarantee for mineral water to be without carbon dioxide addition. It's just less than in "Medium". Turn the bottle on its head and look for bubbles. "Naturell" or similar are safer in that respect. Heavy glass in the "standard" deposit 0.75l bottle form is usually suspicious but it's not like plastic bottles cannot contain heavily carbonated water either. If you order "water" without any qualifier, you'll get carbonated in a restaurant. "Sprudel" or "sprudelnd" are the German words for "fizz" and "fizzy" respectively, so these too are worth watching out for (as well as the "Kohlensaeure" already mentioned). Not the answer you're looking for? Browse other questions tagged germany food-and-drink tips-and-tricks shopping german-language or ask your own question. Is the tapwater safe to drink in Albania generally and Shkodër specifically? Tipping for free drinks in the USA? Can I bring a growler of beer in my checked bag?